RUTHERFORD, ERNEST, 1st Baron Rutherford, physicist and university professor; b. 30 Aug. 1871 in Spring Grove, near Brightwater, New Zealand, fourth of the 12 children of James Rutherford and Martha Thompson; m. 28 June 1900 Mary Georgina Newton in Papanui (Christchurch), New Zealand, and they had one daughter; d. 19 Oct. 1937 in Cambridge, England. Ernest Rutherford was born into a yeoman family, learning hard work from his father, who was a wheelwright and farmer, and gaining a love of knowledge from his mother, a former teacher. Although his family moved several times, he was able to obtain a standard primary education in state schools. For his secondary instruction, a scholarship took him in 1887 to Nelson College, where he achieved a solid grounding in the classics and in mathematics; however, he showed no inclination towards a scientific career. Success at Nelson carried him in 1890, again with a scholarship, to Canterbury College at the University of New Zealand in Christchurch. There he was exposed to the typical scientific and mathematical curriculum of the time, but the college’s unorthodox master, Alexander William Bickerton, piqued his interest in science. 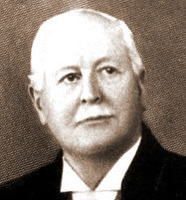 Obtaining his ba in 1892, Rutherford was granted a scholarship by Canterbury to pursue graduate work in mathematics and physics. Awarded an ma the following year, he remained at the college during 1894 to undertake research in physics. His study of how magnetized iron could receive radio waves was presented in two papers published by the New Zealand Institute and earned him a bsc from the university in 1894. That year he also became engaged to be married. New Zealand offered no further means of advancement for Rutherford. The centre of the world for English-speaking physicists was the Cavendish Laboratory at the University of Cambridge, founded in 1874 and presided over by the remarkable Joseph John Thomson. Rutherford gained a coveted 1851 Exhibition Scholarship at just the right moment. Cambridge had changed its regulations to create a ba research degree; graduates from other universities could take a Cambridge degree after two years’ residence and the completion of a research project. When he arrived in 1895, Rutherford was the first of these students. He intended to continue with his work on radio waves, but the announcement that German physicist Wilhelm Conrad Röntgen had discovered what would later be known as X-rays altered his plans. Thomson, already renowned for his study of cathode rays, pulled Rutherford into an investigation of X-rays. They found that X-rays break molecules of gas into charged units, ions, which are attracted to metal plates. Their joint paper in 1896, “On the passage of electricity through gases exposed to Röntgen rays,” printed in the London, Edinburgh, and Dublin Philosophical Magazine and Journal of Science (London), provided the theory and data to explain this phenomenon. In the same year French physicist Henri Becquerel discovered the radioactivity of uranium; Pierre and Marie Curie and others quickly found additional radioactive elements. Examining the behaviour of uranium, Rutherford recognized that two distinct rays were emitted. One, which he named alpha, ionized gas easily but could not penetrate far into foil; the other, dubbed beta, was a poorer ionizing agent but travelled further. Rutherford’s two-year scholarship ended in 1897 but it was renewed. Although he continued to work at the Cavendish, he wanted a permanent position so that he could marry. The following year Hugh Longbourne Callendar, a brilliant former student of Thomson’s who had gone to Montreal in 1893 to become one of the two Macdonald professors of physics at McGill University, decided to move to University College, London. Rutherford was keen to apply for the position at McGill and persuaded several colleagues to pull strings for him. Thomson was evidently not enthusiastic about losing the young scientist but he wrote a strong letter of support. The senior figure in physics at McGill was a Cambridge graduate, John Cox. He was not a researcher but had worked with philanthropist William Christopher Macdonald* on plans for the Macdonald Physics Building. Designed by Andrew Thomas Taylor, it was the best-equipped and most modern laboratory building in the world. Cox was interested in hiring another Cambridge man, and he and Principal William Peterson* travelled to the university to interview candidates. They decided that Rutherford was right for the position. Before leaving England Rutherford met John Cunningham McLennan, a Canadian who arrived to study under Thomson and who would become a close friend when he took up a physics post at the University of Toronto. Rutherford arrived in Montreal in September 1898. Callendar had created a small research team, headed by Howard Turner Barnes, which was concentrating on calorimetry, the precise measurement of temperatures. This work had a strong utilitarian focus and might have conflicted with Rutherford’s very different orientation. However, Rutherford’s affability and enthusiasm smoothed over any possible trouble. 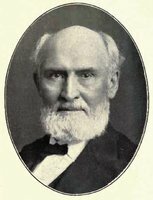 He became the key figure in energizing the McGill Physical Society and was elected in 1900 to section III of the Royal Society of Canada; he would serve as section vice-president in 1905 and president in 1906. In 1900 he returned to New Zealand for several months, married his fiancée, and then brought her to Montreal. The research on radioactivity begun at Cambridge expanded at McGill. Rutherford shifted his attention to thorium, and he discovered several variants of the element. A number of theories competed to explain radioactivity, but none had solid experimental evidence. Rutherford was assisted by colleagues, such as Barnes and Robert Bowie Owens from the department of electrical engineering, and students from Canada and abroad. A key collaborator was Frederick Soddy, an Oxford-trained chemist who had been appointed demonstrator at McGill in 1900. Out of a debate between the two at the Physical Society over the nature of the atom came the inspiration for a joint project. Rutherford needed a chemist’s knowledge to extend his work on thorium. Soddy provided ideas as well as laboratory skills. They concluded that a radioactive element spontaneously changes (a process eventually known as radioactive decay) and turns into an isotope of the element, which is a completely different substance. Thus, thorium by stages converts into several forms, each unique. Each radioactive isotope or element has its own half-life, a period of time during which, statistically, half the atoms of a sample will decay into the next form of the series. Their groundbreaking papers, published in 1902 and 1903, almost immediately convinced the physics community. Chemist Otto Hahn came from Germany in 1905 to learn more about thorium, while Arthur Stewart Eve* came from England to collaborate (Eve would eventually return to McGill to direct the physics department). As a teacher Rutherford could be gruff and disparaging towards poor scholars, but he was strongly supportive of the good ones, and would be almost universally loved by former students. 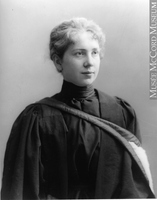 Canadians included Robert William Boyle and Robert Kenning McClung, later professors at the University of Alberta and the University of Manitoba, respectively, and Harriet Brooks, one of the earliest women physicists involved in radioactive research. Rutherford’s work at McGill resulted in Radio-activity (Cambridge, England, 1904) and an invitation to deliver the Silliman Memorial Lectures at Yale University in 1905, issued as Radioactive transformations (New York, 1906). In 1906 Arthur Schuster announced his intention to retire from the professorship of physics at the Victoria University of Manchester, and he requested that Rutherford replace him as head of the first-class laboratory he had built up. Rutherford and his family arrived in England in May 1907. Schuster’s assistant, Hans Wilhelm Geiger, proved to be an excellent collaborator. At McGill Rutherford had experimented in the bombardment of metal foils with alpha particles – later known to be the nuclei of helium – that emanated from radium. He, Geiger, and several students measured the scatter of these particles by various methods over the next three years. Thomson had posited the “plum pudding atom,” in which the negatively charged electrons were embedded in an atom of diffused positive charges. In 1911 Rutherford announced that, on the basis of his experiments, atoms must have small, massive nuclei surrounded by electrons. His conclusion was, in broad form, the basis of the modern vision of the atom, and Rutherford’s second great contribution to science. The following year physicist Niels Henrik David Bohr came from Denmark to work with Rutherford, and he soon provided a more detailed view of how electrons orbit the hydrogen atom, based on physicist Max Karl Ernst Ludwig Planck’s idea of the quantum. Another student, Henry Gwyn Jeffreys Moseley, working with Rutherford, found that bombarding atoms with electrons produced spectral lines that could be used to predict how much positive charge lay in the atom’s nucleus. This allowed physicists to understand the periodic table, developed in the 19th century by Russian chemist Dmitry Ivanovich Mendeleyev on the basis of atomic weight, as a series of heavier nuclei determined by atomic number, which is the number of protons in the nucleus. Experiments with alpha particles led to a third important idea. Rutherford discovered that bombarding nitrogen gas with alpha particles appeared to produce the kind of recoil obtained by bombarding hydrogen, made only of protons, which seemed counter-intuitive. He quickly realized that the alpha particles must be causing the nitrogen nuclei to break up and release protons. His student Patrick Maynard Stuart Blackett was later able to show that the bombardment actually changes the nitrogen nucleus into oxygen. Rutherford had demonstrated that elements could be transmuted, a possibility that traditional chemists had never countenanced. In 1919 Rutherford moved to the Cavendish Laboratory when he succeeded Thomson as director and holder of the Cavendish Chair of experimental physics at Cambridge. Taking with him his second in command at Manchester, James Chadwick, he continued experiments on transmutation, bombarding other elements with alpha particles. In his Bakerian Lecture before the Royal Society of London in 1920, he suggested that a massive particle like the proton, but without an electrical charge, must exist. Experimentally, this particle, the neutron, was difficult to find; Chadwick spent years trying to locate it, and succeeded only in 1932. Transmutation work under Rutherford also saw the first shift towards what would become Big Science. The term, first used in 1961, refers to the development of large-scale research projects conducted by teams of researchers and funded by governments or international organizations, especially after World War II. Rutherford’s students Ernest Thomas Sinton Walton and John Douglas Cockcroft accelerated protons electrically to bombard and transmute other elements (1932) and to induce artificial radioactivity (1933). Despite being at the centre of these investigations, Rutherford did not believe that nuclear energy could ever be tapped and did not live to see it happen. Ironically, the neutron, postulated by him and discovered by Chadwick, became for physicist Enrico Fermi the means with which to bombard a nucleus. Fermi’s work was the stepping stone for the first splitting of the uranium atom, which took place in the Berlin laboratory of Rutherford’s former collaborator Otto Hahn. Men who would be among the greatest physicists of World War II and the post-war era passed through the Cavendish Laboratory during Rutherford’s tenure. Thanks to his good relations with government and industry, he was able to upgrade the facilities. More books appeared during his Cambridge years: Electricity and matter (Nelson, N.Z., 1928); Radiations from radioactive substances (Cambridge, 1930), written with his assistants Chadwick and Charles Drummond Ellis; The artificial transmutation of the elements … (London, 1933); and The newer alchemy … (Cambridge, 1937). By the time of his death he had also published approximately 180 papers. His outstanding research record and his ability to attract top students meant he did not need to work in obscurity; indeed, he had been lionized by the scientific community from a relatively early age. His McGill work had earned him a fellowship in the Royal Society of London in 1903 (he had been proposed earlier by Thomson, but to no avail). The following year brought the society’s Rumford Medal, and its Copley Medal would follow in 1922. The culmination of his early period was the Nobel Prize in chemistry (not physics, to his amusement), which he received in 1908 at age 37. He held the presidency of the Royal Society from 1925 to 1930. Over the years he collected medals and honorary memberships from a number of national scientific societies and honorary degrees from more than 20 universities, including McGill and the University of Toronto. 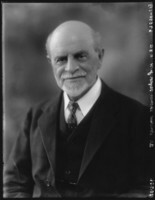 As president of section A of the British Association for the Advancement of Science, he returned to Canada in 1909 for its meeting in Winnipeg. He was knighted on 12 Feb. 1914, awarded the Order of Merit in 1925, and raised to the peerage on 23 Jan. 1931 as Baron Rutherford of Nelson. Ernest Rutherford’s death at age 66, following emergency surgery for a strangulated hernia, was unexpected. He was still managing the Cavendish Laboratory, delivering public lectures, and serving in numerous organizations. At that time he was considered the foremost experimental physicist of his generation; many historians and scientists would consider him the most outstanding of the 20th century. A shy and modest man, he was nonetheless well aware of his strengths. Apart from his remarkable discoveries and ideas, one of his greatest contributions was his support for students and colleagues. Beginning in Montreal, and later in Manchester and Cambridge, he fostered the careers of many, not just from the British empire but from around the world. He was one of the first physicists to encourage women to study and work in the field of physics on an equal footing with men. Despite his great impact on the development of nuclear physics, Rutherford’s influence on the field in Canada was small. McGill’s physics department had been dominated by Cambridge graduates, both Canadian and foreign-born, before his arrival in 1898 and continued to be so long after his departure in 1907. Research in radioactivity was a minor theme in Canadian physics during the interwar years, reflecting the country’s orientation towards applied science. The bulk of Ernest Rutherford, 1st Baron Rutherford’s correspondence, papers, and notebooks are in the Cambridge Univ. Library in England (Add. ms 7653). Small collections of correspondence are located in other libraries and archives. The Rutherford Museum at McGill Univ. in Montreal holds some of his apparatuses. Rutherford’s scientific work was brought together by his assistant in The collected papers of Lord Rutherford of Nelson, under the scientific dir. of Sir James Chadwick (3v., London, 1962–65). Many studies of Rutherford have been published. The first, which appeared two years after his death, was by his long-time friend and collaborator A. S. Eve, Rutherford: being the life and letters of the Rt Hon. Lord Rutherford, o.m. (Cambridge, 1939). Other general studies include E. N. da C. Andrade, Rutherford and the nature of the atom (Garden City, N.Y., 1964); Sir Mark Oliphant, Rutherford: recollections of the Cambridge days (Amsterdam, 1972); and David Wilson, Rutherford: simple genius (Cambridge, Mass., 1983). John Campbell’s Rutherford: scientist supreme (Christchurch, New Zealand, 1999) concentrates on the subject’s formative years in New Zealand. Rutherford is included in a number of biographical dictionaries; the best modern entry, by Lawrence Badash, can be found in the ODNB. Two obituaries provide particularly useful information: A. S. Eve and James Chadwick, “Lord Rutherford, 1871–1937,” Royal Soc., Obit. Notices of Fellows (London), 2 (1936–39): 395–423 and A. N. Shaw, “Lord Rutherford,” RSC, Trans., 3rd ser., 32 (1938), proc. : 93–100. For the period during which Rutherford was at McGill, see T. J. Trenn, The self-splitting atom: the history of the Rutherford-Soddy collaboration (London, 1977), which focuses upon the crucial work of 1902–3. Rutherford’s correspondence with American radiochemist B. B. Boltwood in Rutherford and Boltwood: letters on radioactivity, ed. Lawrence Badash (New Haven, Conn., and London, 1969) provides material on his last years at McGill and his early work in Manchester, Eng. To learn more about the state of the physical sciences in Canada, see Yves Gingras, Physics and the rise of scientific research in Canada (Montreal, 1991). Richard A. Jarrell, “RUTHERFORD, ERNEST, 1st Baron RUTHERFORD,” in Dictionary of Canadian Biography, vol. 16, University of Toronto/Université Laval, 2003–, accessed April 22, 2019, http://www.biographi.ca/en/bio/rutherford_ernest_16E.html.